I Met Mr. President and the First Lady! It’s my prayer partner’s fault. “Have you seen the eagles,” she asked with excitement as she texted me a link. The First Lady, as she’s called, laid two eggs in February. The two eggs hatched a month later. 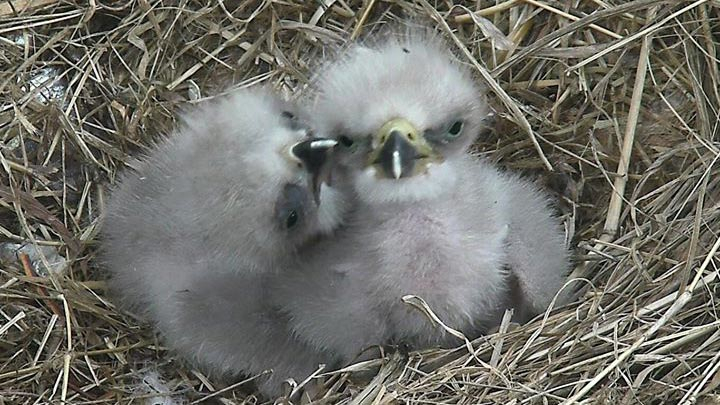 The day I took one peak through the DC Eagle Cam was the beginning of the end. It was a wrap. I was one of 35 million tuning in, since it launched, to what I affectionately call the DC Eagles Reality Show. I suddenly realized why my mom would have the Animal Planet channel on all day. I became my mother and my daughter became me. “Umm, mom…we’re not doing this today,” she would say as I would try to show her the latest updates in the video (haha). I became obsessed! I had been tuning in just to see what they were doing. I even checked on them before I went to bed most nights including last night. They are so interesting to watch and not to mention oh so cute when they first hatched! I noticed that the parents cared for them even before they were born. They kept close watch over their creation. After they hatched, they protected them, feed them and loved on them. Sound familiar? Yep, God plays that role in our lives. He wants us to fly—I mean really fly. This can only happen with His help. We need His help to get us through life’s trials and to help us reach our full potential. Soon the eaglets will be pushed out of the nest so they can fly and reach their full potential too. I know it sounds horrible to be “pushed” out of the nest, (I thought so too–YIKES!) but God gives us everything we need to make the same flight. The pressure to fly for the eaglets is the same pressure He puts on us to get the best out of us. God loves us and wants us to soar like eagles! 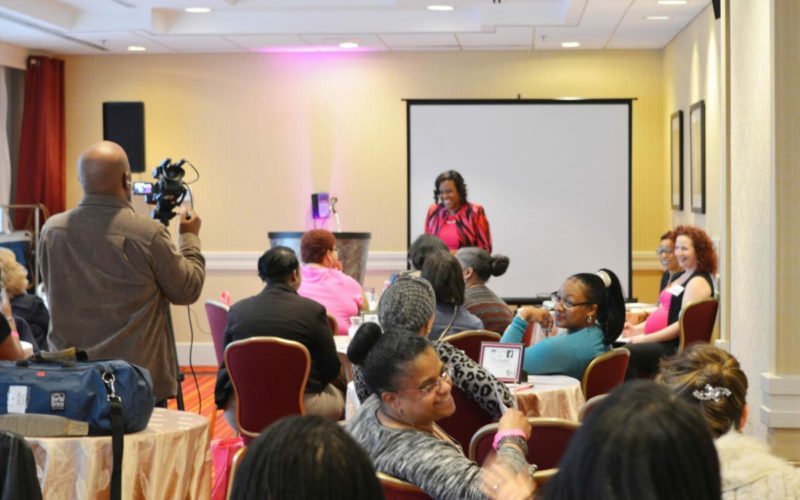 I pray that I planted that very same seed of soaring like an eagle in my talk last month, “I See Dead People: Reviving the Gifts Within.” We had a ball as you can see from the picture. This is the moment when I told them to, “Tell your neighbor that you’re pregnant.” As you can imagine the place went wild! My point was that we all are pregnant and it’s time to push the baby out. It’s time to register for that class, enroll in school, put that conference together, write the curriculum, book, song, patent that invention, put on that play, write that script and start that business…whatever it is, IT’S TIME TO PUSH IT OUT! 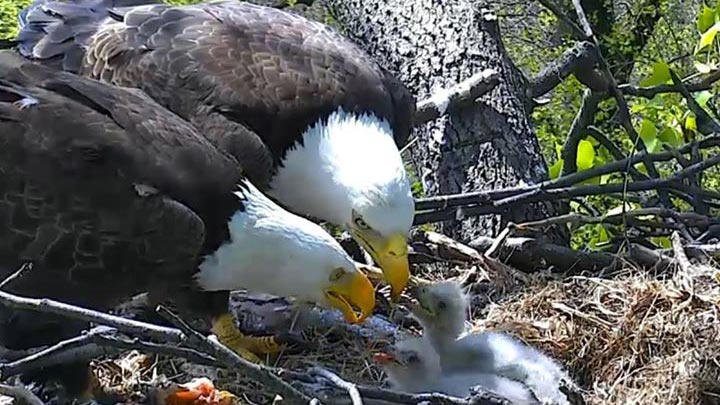 Mr. President, the dad, would bring back fish and they would feed the eaglets together. Mom and dad had excellent teamwork too. The thing that was mind-boggling was just when you had not seen them in a couple of days, they were much bigger and changing at a rapid rate! A few days ago the public named them “Freedom” & “Liberty”. How cool! So why is the eagle so special? Selected as our national bird, the eagle has appeared on all official seals of the United States, as well as on most coinage, paper money, and on many U.S. stamps. The eagle represents freedom. Living as he does on the tops of lofty mountains, amid the solitary grandeur of nature, he has unlimited freedom, whether with strong pinions he sweeps into the valleys below, or upward into the boundless spaces beyond. Does anyone wanna be free like that? For those of you who need help in that department, I want to introduce a new offering. We’ve all been to a crankin’ party, but have you ever partied with a purpose? Introducing the Destiny Design Party™. It’s the place where you unlock the road map to your purpose. Those who know me, know that I dig deep; I will get to the root of what’s holding you back and help you to stand up to your innermost fears. The Destiny Design Party™ will give you the boost you need to move forward in the pursuit of your God-given purpose. This is done through fun exercises, engaging questions, games such as “Truth or Dare” and other surprises. We’ll have deep conversations about you and your goals, and start the process of uncovering what is it you were put on this earth to do. The goal is to get moving in your purpose to get on the road to your destiny! You’ll even get a one-on-one coaching call with me post-party. Get together 10 girlfriends and I’ll come to you! We will party the night away–in your purpose that is 😉 . So if this sounds interesting to you and you would like more information, feel free to call or email me at info@singlemamawithnodrama.com.